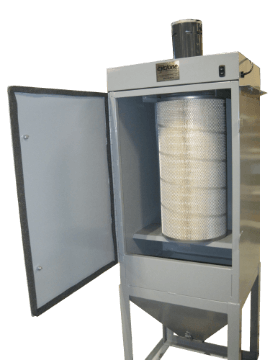 Cyclone sandblasting dust collector systems are specifically designed to keep the work area inside a blast cabinet visible. If you are looking for the best blast cabinet dust collector available for sale today we can help. We currently have two sizes perfectly designed for blast cabinet dust collecting. We also have a cyclone dust collector that includes an easy to use media separator. Our models range from 90 CFM all the way up to industrial dust collectors at 400 CFM. Cyclone dust collectors are extremely powerful, reliable, and easy to maintain. Additionally, all our models are made in the USA and backed by Cyclone’s manufacturer warranty. We also have all replacement parts in stock should you need them. Prices shown are list prices without shipping. Please contact us by phone or email for a shipping quote. Need a custom dust collection system? We can help, just let us know what you need. A sandblasting dust collector is an important part of any abrasive media blasting cabinet. Why? If you cannot see what you are doing in the blast cabinet, the blast stream could damage the parts. You can easily avoid this situation by adding a Cyclone dust collector to your system. As soon as you power it on you will see improved visibility. Dust Extractor or Dust Collector? For our purposes they are the same thing. A sand blast dust extractor and sandblaster dust collector perform the same duties within a sandblast cabinet. As the unit extracts air from the abrasive blasting cabinet it naturally collects the dust within the body of the unit. Consequently, the specially designed filter cloths and filter cartridges help ensure the dust does not reach the motor. We include the necessary filters on your equipment to protect the dust collector motor. Debris and dust that naturally occurs during blasting can destroy dust collector parts. Luckily, we provide filters and wraps that prevent micro particles of dust and debris from reaching the motor. Over time, parts do eventually wear out. But, we provide easy to follow maintenance instructions to keep your dust collector running for years.